(Nanowerk News) As ESA’s remaining supply ferry to the International Space Station burns up in the atmosphere, its final moments as its hull disintegrates will be recorded from the inside by a unique infrared camera. An ESA-led team designed and developed the Automated Transfer Vehicle (ATV) Break-Up Camera in just nine months in order to make it on board in time. 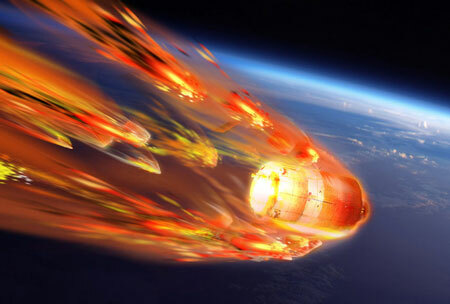 Artist’s view of ATV-5’s destructive reentry into Earth’s atmosphere over the Pacific Ocean. ESA’s fifth and last Automated Transfer Vehicle,Georges Lemaître, will be launched on an Ariane 5 this summer from Europe’s Spaceport in Kourou, French Guiana to deliver supplies to the International Space Station. Working at breakneck pace, the team designed, built and tested both the camera and the Reentry SatCom capsule to work like an aircraft-style ’black box’ to store images, then transmit them to Earth after the vessel’s break-up via an Iridium satellite link. ESA’s BUC camera will join Japan’s i-Ball optical camera and NASA’s Re-entry Break-up Recorder to give as full a picture as possible of the conditions inside the vehicle as it breaks up. “These different instruments will complement each other,” explains Neil Murray, leading the project for ESA. NASA has flown similar experiments before with its recorder, while JAXA’s i-Ball gathered photos during the reentry of their supply ship in 2012. For ESA, this is something new, however. The challenge has been to design a capsule to survive the 1500ºC reentry and transmit useful data to the ground no matter its altitude or orientation. It also needs to overcome the blackout effect of the blowtorch-like ‘plasma’ of electrically charged gases enveloping reentering objects. The infrared camera, bolted to an ATV rack, will burn up with the rest of the spacecraft, but imagery of the final 20 seconds will be passed to the Reentry SatCom, a spherical capsule protected by a ceramic heatshield. “The Reentry SatCom has an antenna, so that once ATV breaks up it begins transmitting the data to any Iridium communication satellites in line of sight,” adds Neil. “The break-up will occur at about 80–70 km altitude, leaving the SatCom falling at 6–7 km/s. The fall will generate high-temperature plasma around it, but signals from its omnidirectional antenna should be able to make it through any gap in the plasma to the rear. ESA’s Automated Transfer Vehicles (ATV) supply the International Space Station with fuel and cargo as well as boosting the Station’s orbit. The latest and last of ESA’s five automated space freighters, Georges Lemaître is being prepared for launch by Ariane 5 from Europe’s Spaceport in French Guiana. 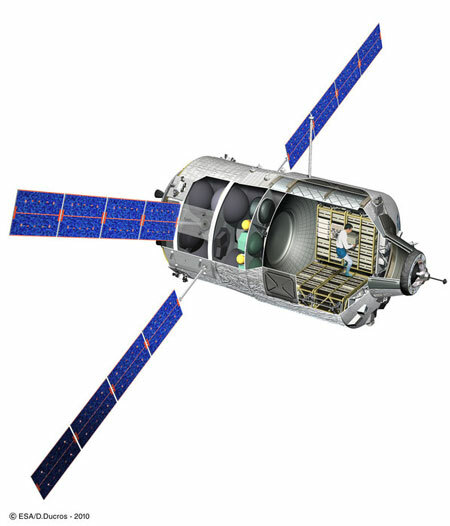 Once in orbit, the ferry will dock to the Station to deliver more than six tonnes of propellant, supplies and experiments to the orbital outpost. Then, after some six months as part of the Station, it will deliberately reenter over a remote part of the Pacific Ocean to burn up harmlessly.